A key to this idea is that cave art is often located in acoustic "hot spots," where sound echoes strongly, as some scholars have observed. Those drawings are located in deeper, harder-to-access parts of caves, indicating that acoustics was a principal reason for the placement of drawings within caves. The drawings, in turn, may represent the sounds that early humans generated in those spots. In the new paper, this convergence of sound and drawing is what the authors call a "cross-modality information transfer," a convergence of auditory information and visual art that, the authors write, "allowed early humans to enhance their ability to convey symbolic thinking." The combination of sounds and images is one of the things that characterizes human language today, along with its symbolic aspect and its ability to generate infinite new sentences. "Cave art was part of the package deal in terms of how homo sapiens came to have this very high-level cognitive processing," says Miyagawa, a professor of linguistics and the Kochi-Manjiro Professor of Japanese Language and Culture at MIT. "You have this very concrete cognitive process that converts an acoustic signal into some mental representation and externalizes it as a visual." "I think it's very clear that these artists were talking to one another," Miyagawa says. "It's a communal effort." The paper, "Cross-modality information transfer: A hypothesis about the relationship among prehistoric cave paintings, symbolic thinking, and the emergence of language," is being published in the journal Frontiers in Psychology . The authors are Miyagawa; Cora Lesure, a PhD student in MIT's Department of Linguistics; and Vitor A. Nobrega, a PhD student in linguistics at the University of Sao Paulo, in Brazil. "It's very difficult to try to understand how human language itself appeared in evolution," Miyagawa says, noting that "we don't know 99.9999 percent of what was going on back then." However, he adds, "There's this idea that language doesn't fossilize, and it's true, but maybe in these artifacts [cave drawings], we can see some of the beginnings of homo sapiens as symbolic beings." While the world's best-known cave art exists in France and Spain, examples of it exist throughout the world. One form of cave art suggestive of symbolic thinking -- geometric engravings on pieces of ochre, from the Blombos Cave in southern Africa -- has been estimated to be at least 70,000 years old. Such symbolic art indicates a cognitive capacity that humans took with them to the rest of the world. "Cave art is everywhere," Miyagawa says. "Every major continent inhabited by homo sapiens has cave art. ... You find it in Europe, in the Middle East, in Asia, everywhere, just like human language." In recent years, for instance, scholars have catalogued Indonesian cave art they believe to be roughly 40,000 years old, older than the best-known examples of European cave art. But what exactly was going on in caves where people made noise and rendered things on walls? Some scholars have suggested that acoustic "hot spots" in caves were used to make noises that replicate hoofbeats, for instance; some 90 percent of cave drawings involve hoofed animals. These drawings could represent stories or the accumulation of knowledge, or they could have been part of rituals. In any of these scenarios, Miyagawa suggests, cave art displays properties of language in that "you have action, objects, and modification." This parallels some of the universal features of human language -- verbs, nouns, and adjectives -- and Miyagawa suggests that "acoustically based cave art must have had a hand in forming our cognitive symbolic mind." To be sure, the ideas proposed by Miyagawa, Lesure, and Nobrega merely outline a working hypothesis, which is intended to spur additional thinking about language's origins and point toward new research questions. Regarding the cave art itself, that could mean further scrutiny of the syntax of the visual representations, as it were. "We've got to look at the content" more thoroughly, says Miyagawa. In his view, as a linguist who has looked at images of the famous Lascaux cave art from France, "you see a lot of language in it." But it remains an open question how much a re-interpretation of cave art images would yield in linguistics terms. The long-term timeline of cave art is also subject to re-evaluation on the basis of any future discoveries. If cave art is implicated in the development of human language, finding and properly dating the oldest known such drawings would help us place the orgins of language in human history -- which may have happened fairly early on in our development. "What we need is for someone to go and find in Africa cave art that is 120,000 years old," Miyagawa quips. "If this is on the right track, it's quite possible that ... cross-modality transfer helped develop a symbolic mind," Miyagawa says. In that case, he adds, "art is not just something that is marginal to our culture, but central to the formation of our cognitive abilities." 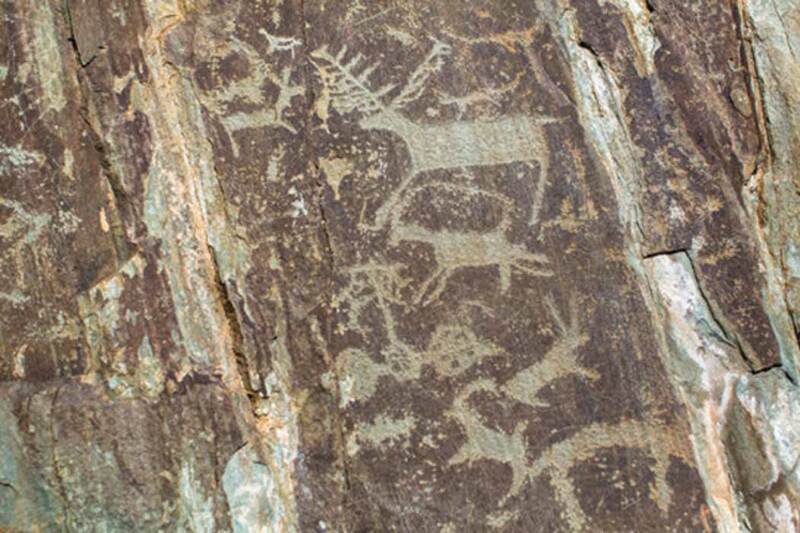 Top image: Ancient art in the Altai Mountains, Russia. While the world’s best-known cave art exists in France and Spain, examples of it abound throughout the world. The article “ Did humans speak through cave art? Ancient drawings and language's origins ." was originally published on Science Daily. I personally believe that the acoustic properties of a cave have nothing to do with the images or our linguistic development. I am not convinced that the acoustic properties of these locations would have changed over the many thousands of years in question.